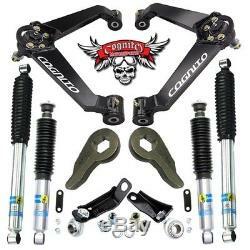 Cognito Hummer H2 - Boxed BJ Control Arms Leveling Kit Stage 4 w Bilstein Shocks. 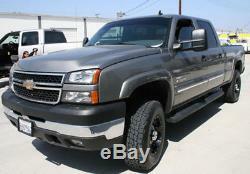 LISTING IS FOR ONE COGNITO LEVELING KIT - CLKP-1002.4. 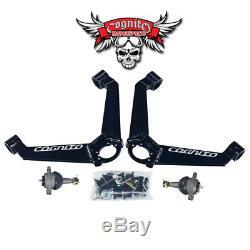 1 - UCAK100010 - Cognito Boxed Upper Arms - Ball Joint Style - Pair. 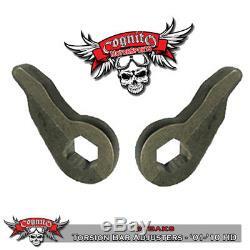 1 - TBAK8 - Cognito Forged Torsion Leveling Keys - Pair. 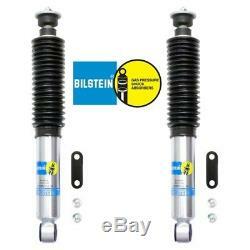 2 - BIL-LFK-GM8L-2001 - Bilstein 5100 Series Front Shocks - Pair. 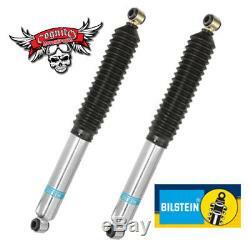 2 - BIL-SR-GM8L - Bilstein 5100 Series Rear Shocks - Pair. 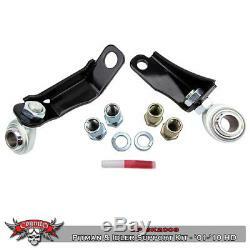 1 - PISK2008 - Cognito Pitman Idler Arm Support Steering Brace Kit. 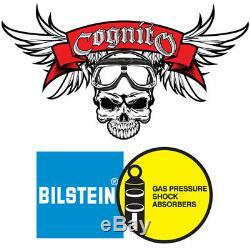 Stage 3 Bilstein Shocks Cognito Control Arm Leveling Kit. Upper Control Arms are: Ball Joint Style Boxed Steel Construction (NO Shock Mounts). Geometry of the GM IFS Front Suspension - Almost a Good Design. First off, the original equipped front shocks are too short from the factory, topping out at full extension before the upper control arms ever comes close to touching the bump stops. This is extremely hard on the front shocks and premature failure is unavoidable. The second problem is that factory upper control arms hit the down travel bump stops before they ever reach the maximum travel potential. Even on the 4wd models, the front CV axles have more travel potential than GM provides from the factory. We believe this is a big design flaw on the front suspension of a 01-10 8-lug model vehicle. Transforms the front suspension into a superior engineered design! Lets face it, you get what you pay for! Cognito Motorsports has created a better system in several ways. 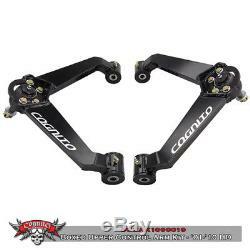 BOXED ARMS NEW The Cognito "BOXED STYLE" front upper control arms are now available and we have paired them with the correct front shocks. It is important to use the correct shocks due to length and internal strength being critical since the shock is also the droop limiter. By doing this Cognito has taken the suspension droop (top out) load off the upper ball joint and transfered it to the shock, which now acts as a limiting strap. This design extends the life of the upper ball joint greatly. 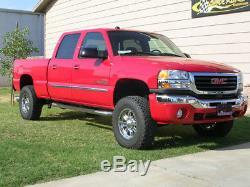 Improved suspension travel is the key to a great ridding truck with leveled suspension. 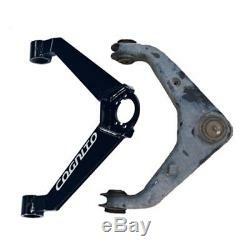 Cognito upper control arms, correct the upper ball joint angle that is a problem with the factory upper control arms after turning up the suspension. The alignment of the front end is also corrected so that it will fall into factory alignment specifications, something that is almost impossible on a leveled truck with the factory upper control arms. When used with the proper shocks or shock spacers, 28% more suspension travel can be achieved over stock. Please understand these arms do not actually lift the vehicle. You will need to adjust the torsion bars and or install lifting keys to get the vehicle to sit higher. These arms allow for the extra travel needed when adjusting the torsion keys. Some will say, adjusting the torsion keys or adding new lifting keys will automatically give you a harsh ride, thus blaming the torsion keys themselves. This is just simply not true, re-indexing the torsion bars does not change the spring rate of the torsion bar. That being said, there are other components necessary to do the job correctly and not cause the vehicle to experience a harsh ride. Things like incorrect shock length and extreme ball joint angles can cause the vehicle to ride rough. This kit has all the components to get the job done correctly and give you a better than factory ride! A wheel alignment will be necessary after installing this kit. A torsion bar unloading tool is necessary to complete this installation safety. If you are unfamiliar with this procedure please have a qualified mechanic perform this upgrade. AMOUNT STATED ABOVE DOES NOT APPLY TO THESE DESTINATIONS. 48 LOWER US STATES ONLY! Local pick-up can be arranged. Product availability is not guaranteed after 10 days. We are honest real live people that run a REAL retail store and want to make a life long customer! After this 48 hour period ALL SALES ARE FINAL. Item must be original packaging, unused and in re-sellable condition. Powered by SixBit's eCommerce Solution. The item "Cognito Hummer H2 Boxed BJ Control Arms Leveling Kit Stage 4 w Bilstein Shocks" is in sale since Wednesday, October 25, 2017. This item is in the category "eBay Motors\Parts & Accessories\Car & Truck Parts\Suspension & Steering\Control Arms & Parts". The seller is "sevensat" and is located in Buena Park, California. This item can be shipped to United States.